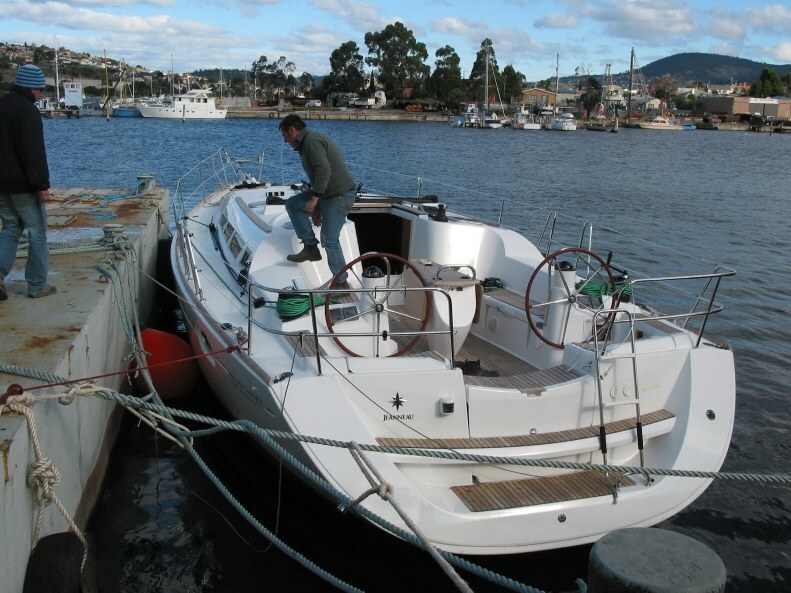 Originally published on the Jeanneau Owners Forum and reproduced here by kind consent of the Author. Our new 42i performance arrived today at the commissioning yard. 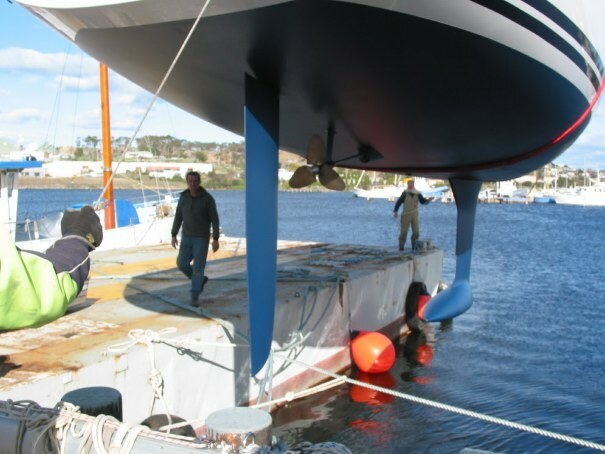 When the boat arrived it was completely shrink wrapped, with only the wrapped up mast on top of the boat and the keel/rudder on their own cradle. 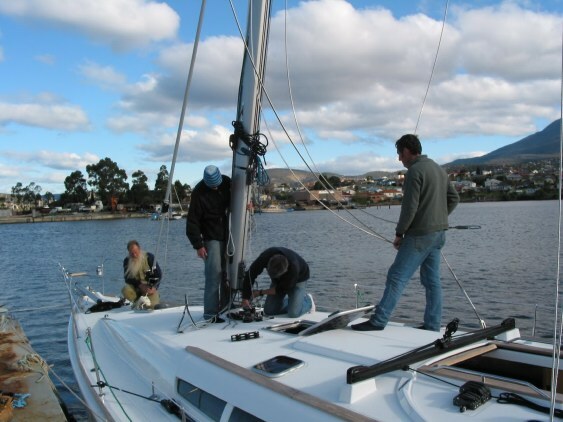 •	Unload the keel with a forklift. Stand it up in a supporting cradle. 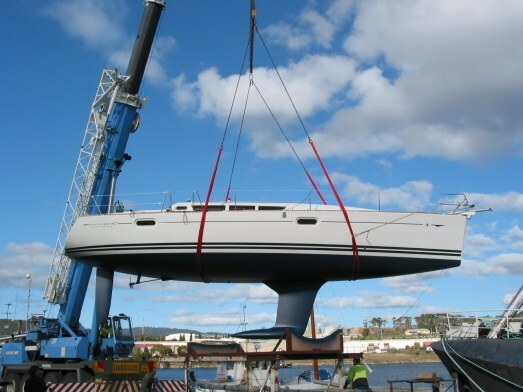 •	Lift the boat with keel attached up into a higher cradle. The keel will be lowered next week so sealant can be inserted, then the keel will be re-attached, filler will be allowed to partially cure, then the keel bolts will be torqued. Also next week I'll begin work on the mast, running cables, deciding if I need to get any additional bits from Selden, deciding whether to add a masthead tri-light, deciding where to put the antenna mounts (VHF and 3G). We'll also be adding an inner forestay fitting and halyard on the mast (for a storm jib and also as a place to fly a heavy weather jib or jib-top without removing the furling headsail from the forestay). The Raymarine SeaTalkNG backbone will be connected directly to the NMEA2K backbone. The electrical levels are the same as are most of the PGN's. •	Radar. If we do decide to install radar I'll probably return the Garmin 750S and get a 6012 instead for screen real-estate and also to gain the ability to overlay radar and map data. Yesterday the bottom was sanded in preparation for barrier coat and antifoul. The shipwright also installed a through hull forward for the deck wash pump. On the 42i there's a great place under the forward end of the front v berth for the deck wash pump assembly. Just aft of this forward most compartment is another compartment that is meant for a bow thruster (we don't have one). When the deck wash stuff was being installed I got a chance to see the equipment that supports the windlass. The installation looks great. The motor and gearbox are completely isolated from the anchor locker and the electrical gear is easy to get at and presumably easy to work on if something fails. Today 2 coats of epoxy barrier coat were sprayed on, followed by a tie coat. Tomorrow 3 coats of anti-foul will go on. The first coat will be red, followed by two coats of blue, again all sprayed. The reasoning is that when we haul out and see red on the bottom we know that we need to do some touch up. I've been working on the mast. Just unwrapping it took 2-3 hours. Then I started cable pulling. There will be a 3G antenna, a VHF and a Glomex TV antenna at the masthead. Tomorrow this job will be finished, along with installation of the cable for the masthead wind gear. Looking at the owners manual last night, I was moderately impressed. They are quite complete in some areas (system diagrams) and somewhat lacking in others (for example, there are no directions that I've found yet for the electrical panel, particularly the gauges switching). I pulled a cable into one of the two mast channels today. The channels are on the aft side of the mast (inside). They seem quite adequate in size but the particular cable I was pulling (LMR400 for the 3G phone/data system) is very stiff. The channel I was trying to use already had one of the factory installed power cables in it (to the masthead). This made it a very tight and dicey pull. It took two of us and some anxiety over the amount of pull required. I wasn't worried about the RF cable but I feared that we'd break the mouse line that was used for pulling. I eventually got some electricians cable pulling lube and that helped enough to get the job done. Tomorrow the other channel is meant to receiver the Raymarine masthead wind sensor cable, an RG6 coax for the TV antenna and (if there's room) an RG213 for the VHF. If there isn't room I'll revert to RG58/CU for the VHF - a bit more attenuation but there's only so much room. I also pulled a new mouse line into the first channel and will do the same with the second, just in case. Currently agonizing over the radar / no radar decision. If I do decide to spring for the $2k+ or so for radar I'll upgrade the currently planned GPSMap 750S to a GPSMAP 6008. The screen is slightly bigger but, more importantly, the 6008 allows radar/chart overlays and the 750S doesn't. It seems that the factory forgot to include the masthead anchor light fixture and the steaming light fixture - at least we can't find them anywhere. 4 people have searched the boat so far with no luck. What I may do is get a masthead tri-color/anchor light and a AquaSignal steaming light. I'll replace the bulb in the anchor portion of the masthead fixture with an L.E.D. bulb. I may also replace the tri-color if I can find one that will work - most LED nav light manufacturers recommend that you use Red LED's for red, green for green and white for white and I don't know yet whether I can buy a bulb that fits with all three colors. Electrician is coming to rig the wind gear and 3 coats of antifoul is the plan, then rigger Monday and Tuesday, into the water and mast stepping Tuesday and then the real work starts. Conspicuous in the work that will be done after launching is installation of the Webasto diesel fired heater, the monster big sine wave inverter, the 4th house battery, the bigger alternator and all the electronics. Things are moving along. 3 coats of bottom paint put on today, then all the protective wrapping from the waterline up removed. Deck wash pump installation completed. The inlet through hull is only a metre or so from the bow. Mast ready for the rigger, all cables pulled and terminated at the top. As Jeanneau forgot to include mast lights, I've purchased a combination tri-light / anchor light and a combination steaming deck light (Forespar, it's much better than the cheapo plastic ones but not as expensive as the Selden light which is a piece of art (and priced accordingly). Rigger coming Monday... will fit the standing rigging to the mast, run the halyards, attach brackets for antennas at the mast head and generally get ready. Diesel heater installation is ongoing. Boat is ready to go in the water. I had a look at the cable arrangements around the mast base. There is a Selden mast step with a hose in it's center that extends through the deck and up about a foot into the mast. Any cables going below will have a drip loop set up using cable ties before they enter the tube to keep water to a minimum. Inside the boat is a very heavy compression post to take mast loads to the keel. This post is hollow and there are (approx) 1.25 inch - 30mm holes, 2 top and 2 bottom in the sides. The idea is that all wires leading down from the mast will be terminated inside the hull near the top of the compression tube. Wires that have to go to the switchpanel are already pulled by the factory through the tube to the top in readyness. There is also an RG58 coax lead from the switch panel/nav station area that the factory has put in place going to the top of the compression tube for a VHF radio antenna. We will add some 75 ohm TV coax and a bit of very low loss coax for the 3G antenna leading from the nav station to the top of the tube. Had my first brief glimpse of the performance sails this morning (in their bags). There isn't much to see as the have taffeta on both sides. More on these later. NMEA 2000 really simplifies much of the integration and interconnection. There will still be a need to communicate using NMEA 0183 between the Icom VHF and the chartplotter to facilitate DSC functionality. The Actisense gateway puts NMEA2000 data onto the laptop via the wireless usb hub and W35 (operating as an ethernet switch). The net result is that the laptop will be wirelessly connected to the boat via the W35 and wireless USB hub - it will be possible to view any NMEA data on the laptop whether it is at the nav station or anywhere else. The Uniden cordless phones connected to the W35 will allow 3G voice coms from anywhere on the boat. They can also be used as an intercom between, for instance, the helm and belowdecks. This may sound quite complicated to some, but for a computer pro it's duck soup. I've had the system operating very well on the bench for extended periods with no problems. If the complex bit (USB over ethernet / ethernet via W35) fails, I can just plug the various USB bits and pieces directly into the laptop via a hardwired hub. I may not have explained well but the diagram, used with my clumsy words, should allow you to gain an understanding of the system. All is going well so far, rigger is appearing Monday, plan is in the water and step the mast Tuesday, then electrical / electronics etc. Still haven't made decision about radar, which Garmin chart plotter and inverter sizing. The co-captain wants to take some kitchen gadgets along, one of which consumes 1500 watts. That's something like 120 amps @ 12 volts. Alternative to honking big 2kw inverter is a 2kw Honda "Quiet" generator. Other alternative is to talk her out of the proposition. If we do wind up manufacturing that magnitude of AC power I'm leaning toward the generator... mostly because if the novelty wears off and we don't use the appliance(s) then I can resell a Honda generator a lot better ($) than a 2kw inverter. Of course the problem with the generator is that it weighs 21 kg, has to be stored somewhere and uses gasoline. Since Jeanneau forgot to include the anchor and steaming lights I've had to purchase some locally. I decided to get a combination anchor / tri-light for the masthead and a combination steaming / deck light. The anchor / tri-light came with a 10 watt Bay 15D anchor bulb and a similar 25 watt bulb for the tri-light. The steaming / deck light came with a 10 watt bulb for the steaming light and a 25 watt halogen bulb for the deck light. I've decided to replace all except the halogen deck light with LED bulbs. The steaming light was easy - I found a very bright warm white LED lamp for it. The anchor / tri-light is a bit more difficult. For the anchor light I got another white LED bulb but had to radically disassemble the fixture to get it in. I bought a white LED to try in the Tri-light but as I expected (and as research suggested) it generates a light that doesn't work well with the red and green filters. I'll order a bulb from Doctor Led that is intended for use in tri-lights. It has a set of red a set of green and a set of white LED's and is designed for this use. Unfortunately it won't get here until after the mast is stepped so someone will have to go up to change it when it arrives. I've used LED nav light bulbs extensively in the past. I can't see any problem so long as good quality bulbs are purchased. Our last boat with red / green / white LED's was usually visible from far away, beyond the two mile requirement. One more thing to spend $$$ on, but it's worth it for the reduction in precious battery consumption, particularly the anchor and tri-light both of which will be used for many hours when the engine isn't running. The reason I converted the steaming light is simply to avoid having to climb the mast whenever a tungsten bulb decides to expire. The deck light (halogen) will be used infrequently and only for a few minutes at a time. It's been a while since last post but a lot has happened. 2 days ago we launched the boat and stepped the mast. It went very well with no mishaps. Amazing what a good, knowledgeable shipwright, first class riggers and a good crane operator/rigger can do. The mast cabling was a tight squeeze, both in the mast channels and through the deck. Selden provides a blue corrugated tube to lead the cables down and it is just barely big enough for our (admittedly big) bunch of wires. After the mast was up and boom installed we discovered that the factory had forgotten to include the solid boom vang. When the dealer contacted the factory they were very cooperative and allowed him to source one locally - probably saved several weeks of freight time. The local installation of the Webasto diesel heater has taken the better part of 4-5 days. Longer than expected. Glad I'm not paying for it. The teak cockpit table was the only other problem noted so far - it looks like it sat outside in the weather for a long time and it has longitudinal cracks. The dealer agrees that it isn't good enough and is organising a replacement from the factory. Also, at the same time, the shipwright will organise a deck cleat for the inner forestay and we'll get the sailmaker to measure for a heavy weather jib. Busy times and lots of work. The heater installation is finally complete. The next day we moved the boat from the commissioning yard to a local club marina that is closer to the sailmaker loft to make it easier for them as the dodger/bimini are completed. During the delivery we tested the heater as it was a dismal morning (about 10 degrees C and raining). All I can say about the heater is it works very well and I think we made the right decision since we intend to use the boat year round. The engine surprised me with it's smoothness and power. The noise level of the 54 HP Yanmar below is noticeably much quieter than the 29HP Yanmar on our former boat. Both the former and the new engine are well surrounded by sound proofing material but the new one is much easier to live with. I intend to add some rubber gap seal where the companionway ladder closes and I expect that to further quiet the engine. The combination of the 4JH4 engine and Max-Prop feathering propeller also impress with their power. At 2500 RPM we were loafing along at a 6.9 knots (instruments have not yet been calibrated so I can't vouch for the accuracy.) The feathering MaxProp shifts into reverse quite smoothly and quickly and stops the boat in a way that inspires confidence. The only new "issues" that have arisen are that the factory seems to have forgotten to send the solid boom vang and installed the wrong primary winches (the Performance version is meant to have Harken 50.2ST's and they installed 48ST's. I'm not unhappy because while the factory made a mistake, they have so far been quick to remedy their error. They authorised the dealer to get a Selden boom Vang locally to save time and the dealer assures us that the correct winches are on the way. •	The trigger shackles on the spin sheets are supplied by Wichard. They impress with their size and quality. •	The Harken rigging components are very well selected. Their sizing is conservative and there is no question that expense was not spared. •	The Selden mast and boom are works or art. There are extra things that I didn't expect - like a T-Ball fitting near the masthead for an inner forestay. The mainsail included one of those very nifty Selden roller cars at each batten location. Surprisingly the sailmaker did not use a roller for the mainsail headboard - we'll add one after commissioning. The first time we raised the main the headboard had a tendency to snag a bit. •	The electrical system is full of bits and pieces from vendors like Blue Seas Systems - top notch stuff. •	The French made performance version sails look great. The sailmaker frowned when he saw them and said (joking) that he was a bit disappointed as he probably wouldn't be able to sell us a new main for 8 years. We haven't had a chance to use them yet but I expect that we won't be disappointed. The quality of the joinery inside is on the higher end of acceptable rather than spectacular. Everything fits well and works well. The new wood that they use - whatever it is - does not have quite the visual appeal of the best Teak but it will do. Some edges of plywood panels under the bunks and settees are unfinished and slightly rough. My wife is an excellent varnisher and she has volunteered to remedy this. There is a need for some of those little 4mm rubber bumpers here and there to suppress vibration noise. The floor panels have no mechanism to hold them down. As we live in an area with frequent rough weather we'll probably do something about that. The shipwright reports that he and his team have been impressed by the build quality - particularly the bulkhead bonding and structural aspects. All in all - so far my overall impression is that the value proposition is great. Any compromises that I have seen so far have been cosmetic rather than structural or mechanical and even these compromises are relatively minor.